While taking wide angle or even ultra wide angle shots the final image when viewed in full resolution on the computer may appear to have color fringing, overlapping cyan or magenta on the fringes. Color fringing is more prominent when the areas which are highlighted are immediately next to dark areas or in other words there is a lot of contrasting colors in a particular area which the lens has trouble focusing on correctly. Color fringing happens as the lens is unable to focus all of the colors (which are in different wave lengths) on the same focal plane and that creates the problem of color fringing in the final result. In an ideal world all the colors traveling in different wavelengths will be able to hit the sensor plane at the correct areas. That rarely happens. As such this problem is also termed as longitudinal chromatic aberrations. For those using very wide angle lenses and shooting to capture the bokeh normally associated with f/2 or faster lenses will be able to identify with this problem a bit more. A number of very high quality lenses are increasingly being manufactured such as Canon’s L (Luxury) series lenses with special UD (Ultra-low dispersion) and Super UD elements which can reduce the effect of chromatic aberrations. What they do is they use different pieces of glass all with different refractive indexes and correct the different wave lengths allowing them to converge on the same plane. EF 70–200mm f/2.8L IS USM is one such lens that has UD elements to correct chromatic aberrations. Canon’s lenses also come with Fluorite elements which also help in reducing this problem. Lenses such as the Canon EF 600mm f/4L IS USM come with Fluorite elements. Precision Molded Optics (PMo) is another element that Canon uses to correct chromatic aberrations. This is present in lenses such as the EF-S 18-135mm f/3.5-5.6 IS STM. However technically it is extremely expensive to manufacture lenses which are 100% corrected for chromatic (as well as Aspherical aberrations) and would be prohibitive for non professional photographers to afford. There is also another type of color fringing which is popularly known as Purple Fringing or simply PF. A ghosting of purple color appears on the areas which are affected which are again towards the edges where the object which is darker and the background which is brightly lit transposes and the lens is unable to correct for the different wavelengths. There are many reasons for which Purple Fringing can happen. Purple fringing often also happens because of the presence of color wavelengths that are outside the visible range but yet affects the DSLR sensors which are sensitive to them. It can also happen because of stray UV light or overexposure when shooting in wide apertures during a brightly lit day. 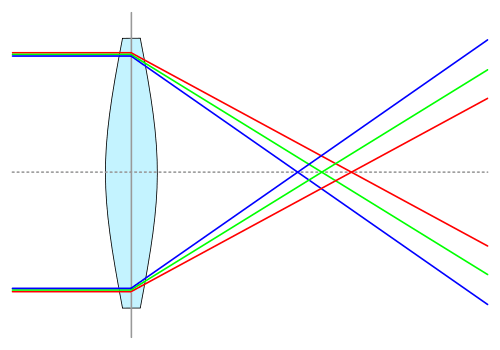 Both purple fringing and longitudinal chromatic aberrations are a problem that is more associated with cameras with cheaper made lenses and more commonly affects cameras which are in the budget range, the compact point and shoot ones. These lenses don’t have UD elements and when they shoot at wide angle ghosting and fringing starts to appear.